When sandbags, buckets and towels are no longer enough… it is time to raise money. Make a gift to our capital campaign, BUILDING TOGETHER ON SACRED GROUNDS, and help the Little Sisters of the Poor provide a safer and more comfortable home for the elderly poor men and women living at the Jeanne Jugan Residence. We must raise $12 million to pay for urgently needed renovations to our Home without affecting our regular operating budget. A study to prioritize projects necessary to sustain a safe and comfortable home for our Residents resulted in a plan encompassing repairs to the residence, the convent and the chapel. To continue our mission, and as good stewards of what God has given us through your generosity, we must tend to our aging buildings’ infrastructures. It is essential to replace windows – original to the 1964 and 1982 buildings – with energy efficient and double-paned windows. Our windows leak, have outlasted their useful life, and are the cause of structural damage to the brick façade – it is separating from the structure. When it rains, water enters our Home through leaky-windows and cracked-brick, creating extensive damage to ceilings, walls and floor tiles in Residents’ and Sisters’ rooms and shared spaces. This means is that the sandbags, bucket and towels, which have provided makeshift relief, for the last decade are no longer enough; and deteriorated conditions can no longer wait to be addressed. Without maintenances, our buildings will continue to deteriorate, resulting in even more costly repairs and soaring utility bills. In addition, to replacing windows and repairing brick, we must replace heating and cooling systems, which are not up-to-code, and make major updates to the 1964 building that houses the convent and the chapel. We are pleased to report progress on these ‘most necessary’ projects. We began Phase I – renovations to the chapel – late last year, by replacing leaky-windows. Regrettably, this work did unveil a new discovery in the ceiling – asbestos – which had to be removed. Additional work to bring the chapel up to the current safety standards – replacing inefficient and nonfunctional electrical systems and HVAC, and installing a fire suppression system mandated by the City – is nearly complete. 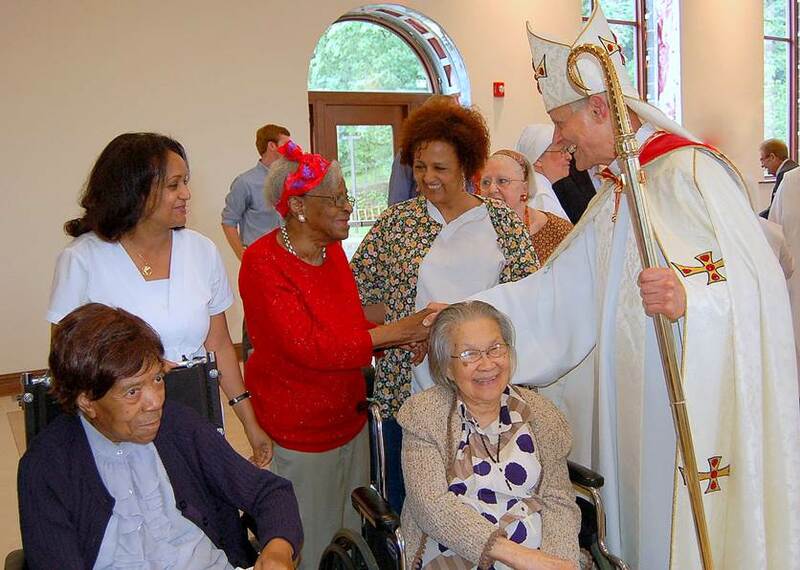 In fact, Residents, staff and Little Sisters from nearby homes joined Cardinal Donald Wuerl, Archbishop of Washington, and Sister Mary Michael, superior of The Little Sisters of the Poor, for the blessing of our newly renovated chapel June 13. Cardinal Wuerl emphasized how the simple yet reverent style of the new chapel mirrors the simplicity of the Little Sisters' life. He also thanked the numerous benefactors without whom the renovation project would not have been possible. Citing the finishing touches still to be completed in the chapel, Cardinal Wuerl reflected that faith is always a work in progress, and for the Little Sisters, there is always another act of charity to be done in caring for the needy elderly. In Fall, we will begin Phase II that concentrates on replacing HVAC systems and windows original to the 1964 and 1982 buildings, as well as renovating the education, worship, living and working spaces on the 2nd and 3rd floors of the convent. In addition, we will address further safety issues – black mold, asbestos and out-of-code fire suppression systems – and create space for Junior professed Sisters. We witness the hand of Divine Providence in the everyday life of our Home. The words of our Mother Foundress, Saint Jeanne Jugan, always confirm our confidence: “Give, give us this house, if God fills it, God will not abandon it.” With the continuing help of our friends and benefactors, like you, we know that God will always provide, as we continue our mission to serve and care for the elderly poor in Washington, D.C., we are committed to showing each one that they are loved, valued and respected. Please, can you help us by pledging a regular monthly donation or even a one-time gift?